We take pride in offering a truly unique daycare program in the Mason area. Our pet guests enjoy a fun, friendly and safe environment every day. This program allows your dog to socialize and exercise all under the supervision of our highly trained staff. Pet guests enjoy separate play areas, with activities directed by our Pet Care Specialist. Dogs are selected to daycare groups based on their size, temperament and play style to ensure the best experience for all our pet guests. We are an indoor and outdoor doggie daycare. 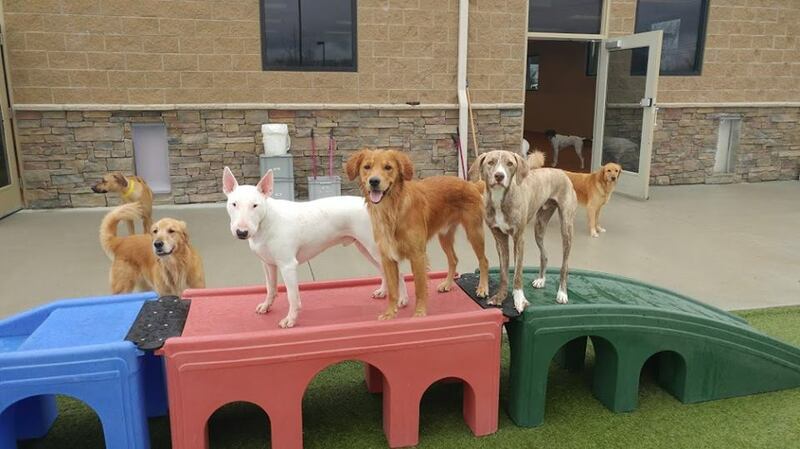 Our daycare dogs have access to our enclosed outdoor spaces all year round. Daycare fills up quickly, so please contact us for availability and to schedule an evaluation. The last drop off is 3 PM. Our latest pickup time for daycare is 7pm. Any unscheduled pick-ups after 7pm will incur a $20 charge until 10pm and a $40 additional charge after 10pm. Late picks-up from daycare and overnight stays must be scheduled and paid for at least one hour before closing. Please see below for late scheduled late pick-up pricing. Daycare evaluation must be scheduled in advance prior to first visit. Please ask for more information. All packages are non-refundable and are subject to expiration. Multiple Family Member Discounts are only applied to pets that live in the same household.